I have loved horses since I was a young girl, but my family’s farm was not set up for them. Luckily I had a friend who shared her love of horses with me and began lessons at her barn in 1999. In 2000 bought my first appendix quarter horse named Cash. I started lessons at a different stable and became friends with 4 sisters in 2002. It was during this period that we all learned more about horses and began studying the fundamentals of horsemanship. I and my husband bought our farm at the end of 2002. We also purchased two foals, Brandi and Nikki and a mare named Lucy. 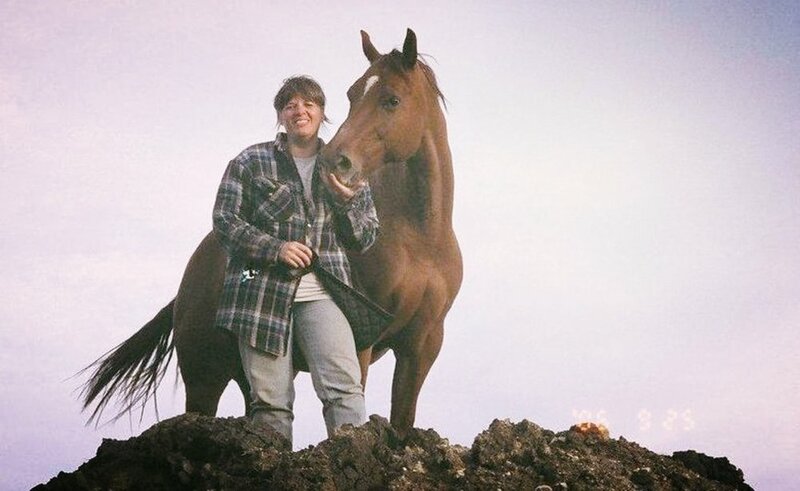 In 2005 I bought Trapper, a big Belgian mare as a riding horse for my husband and adopted a TB off the track who had been used as a jumping horse but had had an injury and had to retire from jumping. In the same year, a pony named Hailey also came to live with us. My friend and coworker Theresa and I started searching and taking horse health clinics on soundness and alternative healing for horses and horsemanship. This eventually led to meeting Christine in 2009. My own journey of loss with laminitic horses has driven my search for knowledge and is at the core of my desire to create a platform to help people help their own horses. My passion and dreams are to inspire with information and education and to help people avoid the devastating loss of their beloved equine friends. I believe in giving equines a chance for a happy sound life - hence the name of our farm 'Second Chance Ranch’. Christine and I created Hoof Geeks Barefoot Hoof Care together in 2013 and we are now pleased to travel across Canada each year offering barefoot trimming clinics to empower the horse owner to take their horse’s health into their own hands. I have been working with, loving and learning from horses for twenty-five years. Sometimes I feel more at home in the pasture than I do in the house! Horses have taught me to be humble and patient and they have fuelled my passion for never-ending learning. This passion continues to push me to dedicate myself and further my studies and to teach others to help make the world better for horses and the humans who love and care for them. The desire for never-ending learning came from my family. We were all trained as pilots because my parents had a Bush Plane Air Service when I was growing up. If there was one thing that was hammered into my head as a youngster is that as soon as you think you know what you are doing, you are setting yourself up for a rude awakening. Keen awareness is vital to keep you alive as a pilot. This awareness and curiosity have been of great service in my growing search for knowledge about how and why hooves break down and horses become lame. I’m fascinated by the science and biology of it. I had to learn to trim my own horses out of necessity. I could not find a farrier who would agree to trim my draft horses and when one finally came the horses were usually lame and unrideable for two to three weeks afterwards. Their feet did not look right, but I did not know why. This is when I decided to take matters into my own hands. This was when it became obvious to me that there is a hole in the horse health/hoof health paradigm. Owners, farriers and veterinarians are stuck in the ‘traditional’ way of thinking. All we need to do is look to the horses for the answers. Many are suffering because humans are not asking enough questions to get to the root of their soundness problems. Many of my own horses that have crossed over the Rainbow Bridge have left me in tears. Why did this happen? How can it be prevented in the future? As the old saying goes “you cannot beat experience and you cannot buy brains. So it is best to listen to those who have gone before you.” Every horse I have had the privilege of knowing has taught me so much about hoof and overall lifestyle health. I have also learned a great deal from the efforts and struggles of other horse owners/caregivers that have also felt defeated when they finally reached the “nothing is working" stage. Now 25 years later, I think I have things pretty well figured out. In the last 7 years I have witnessed the birth of two stud colts and a filly at our farm. It’s been incredible to see them benefit all I have learned. They are truly amazing and so very very sound! I hold a Certificate of Equine Soundness Podiatry and Trimming School from South Carolina. This 2 -1/2 year course pushed me beyond my comfort zone to try new things to and to achieve soundness in more than a few hopeless cases. Many of them worked but some horses were too far gone when they arrived at my farm. These horses continue to teach and their lessons can be seen as articulated bones (created by our friends in the Beetlejuice Cafe) on our tables at the Hoof Geeks Clinics and trade shows. My goal in my life is to continue to help horses. To help owners to help their horses. To empower and encourage owners to try to take control of their horse’s soundness and for better or worse I want to be there to help them through their success and failures. I hope to meet you and your horse at one of our clinics one day soon. Christine and her archery horse Percy. Christine and Caliber (who is trying to steal the shot).